Traditionally, when Apple makes a global announcement - usually from the confines of its Cupertino campus - the world sits up and takes notice. While its ability to grab headlines around the world hasn’t changed, the tech giant now shares the stage with fellow titans of the industry, as illustrated by its recent partnership with software leader SAP. Now, the market is as equally compelled by the CEO standing alongside Apple chief Tim Cook during the customary press pose, as the company continues to make serious advancements into the enterprise space. 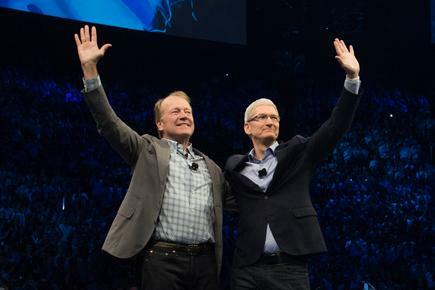 As highlighted when unveiling enterprise grade partnerships with Cisco CEO John Chambers, and IBM CEO Ginni Rometty, Apple has once again strengthened its hand among top-end businesses, deepening its ability to better serve organisations across the world. As reported by ARN, Apple’s agreement with SAP sees the combination of native apps for iPhone and iPad with the software capabilities of the SAP HANA platform. Delving deeper, the partnership will see SAP release new native iOS apps designed to utilise data stored in popular SAP tools, providing customers with new ways to enable mobile workers. Additionally, a software development kit (SDK) and training resources will be released to empower SAP developers, including all the mobile device management vendors. “The partnership is mutually beneficial because it will further strengthen the enterprise proposition of iOS devices for organisations invested in the SAP ecosystem, while also enabling SAP to offer secure and manageable iOS applications that can better support the needs of its customers,” Ovum Research Analyst, Adam Holtby, said. “Additionally, an iOS SDK for SAP HANA will be released that will enable developers to create their own custom business applications. For Holtby, Apple seems to be executing on its plans to make iOS devices more secure and manageable for corporate use within the enterprise. “And this should trickle down to the enterprise mobility management (EMM), mobile application management (MAM), and mobile developer ecosystem, in which iOS is a major ingredient of the service management proposition,” he explained. In many cases, Holtby said these vendors have to limit features on iOS devices due to its closed application environment. “This will not completely solve all features,” he cautioned, “but now SAP customers will get richer and more integrated features. The partnership is similar to those Apple has established with IBM, Cisco and Citrix over recent years, and as explained by Holtby, is further evidence of the vendor strengthening its enterprise proposition for iOS devices. “As it has done with IBM, Apple will work with SAP to develop a suite of apps that are more user-friendly, provide deeper integration, and enable improved levels of employee productivity,” he added. Holtby said this announcement also shows how the need to mobilise SAP apps and business process is critical for customers that want to transform – something that matches what other services providers and customers have been asking of SAP. “These apps will leverage capabilities offered by iOS devices and enable organisations to utilise native apps via a secure mobile platform,” he added. Going forward, Holtby expected Apple to become “more aggressive” in this area, and to get some response from the vendors supporting Android platforms.